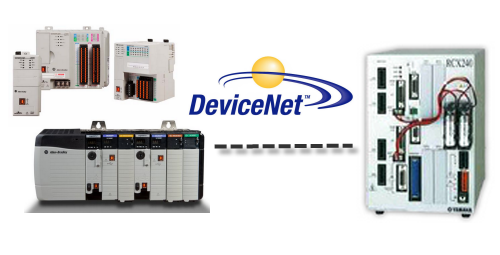 Traditional fieldbus integration using DeviceNET. The memory map from the PLC to the Yamaha controller consumes 24 input words and 24 outputs. Data is exchanged via the DeviceNET fieldbus protocol. Yamaha dedicated I/O control is moved from the physical standard I/O card to a virtual mapping in the PLC to control the Yamaha controller in a traditional integration style.